Located in the River Exchange building downtown Stillwater. 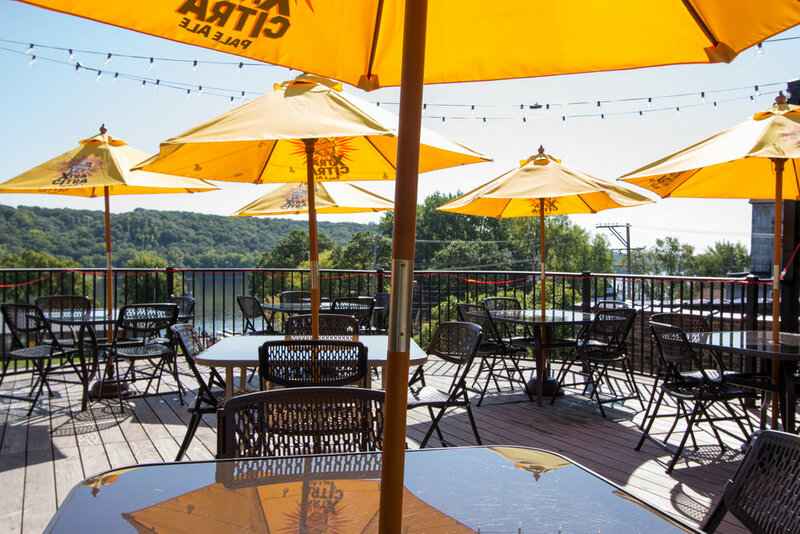 ﻿﻿Enjoy our newly upgraded space with a one-of-a-kind rooftop patio overlooking the Scenic St. Croix River. Strawberry infused vodka, fresh lime, simple syrup topped with sparkling Cava. The perfect "in the sun quencher" made with Old Forrester bourbon infused with balck tea and finished with house lemonade. Our alluring take on a housemade margarita flavored with a light melon liquor and served with a watermelon wedge. Tanqueray Gin and fresh mango puree topped with refreshing ginger soda. This no fail drink has come back to conquer! Cruzan Mango, Guava, Citrus & Pineapple rums mixed with orange and pineapple juice, topped with blood orange. Prairie Organic Cucumber Vodka, St. Germaine liquor, topped with soda and garnished with cucumber slice. The perfect mix of sweet and tart, made with lingonberry jam, fresh mint leaves, limes, and light rum. A true hangover helper to alleviate all last night's bad decisions, housemade mix and all the fixin's. A traditional cocktail with a new age twist. Old Forrester bourbon, orange, cherry and vanilla bitters. Crisp lemon with nice acidity and bright fruitiness with a mineral finish. Aromas of peach, green apple and a touch of oak. Medium-bodied, fruity nose, cherries, plums and spice with subtle oak. Full-bodied and luscious with blueberry and blackberry flavors. Bouquet of raspberry, pear and lychee, hints of pepper and vibrant acidity. JAN 18 High & Mighty is back! FEB 8 Good for Gary returns! Any Pizza half off on Wednesdays!